The God we serve is a Covenant God. You cannot have a Covenant without blood. When you apply the Blood in your home, God will dwell in your home. His Presence will be in your home. Job 1:5: “So it was when the days of feasting had run their course, that Job would send and sanctify them, and he would rise early in the morning and offer burn offerings according to the number of them all. For Job said, ‘It may be that my sons have sinned and cursed God in their hearts.’ Thus Job did regularly.” Job offered an animal blood sacrifice. On your influence or your relationships. Genesis 3, The Scripture reveals the power of the blood right at the Gate of Eden where it says in Genesis 3:21: “Also for Adam and his wife, the Lord God made tunics of skin and clothed them.” There we see the introduction of the blood because those skins were wet with blood of the lamb. Later, having believed by faith, Abel offered the firstborn of his flock as an act of worship for it says in Genesis 4:4: “Abel also brought of the firstborn of his flock and of their fat. And the Lord respected Abel and his offering.” So here we see by faith Abel offered to the Lord the firstborn of his flock. In Hebrews 11:4-5: the Bible mentions the offering when it says: “By faith Abel offered to God a more excellent sacrifice than Cain, through which he was righteous, God testifying of his gifts and through it he being dead still speaks. By faith Enoch was taken away so that he did not see death and was not found, because God had taken him, for before he was taken he had this testimony, that he pleased God.” Here we have something powerful about Abel. He pleased God. In the beginning of Scripture (Genesis 3:21 and 4:4) we see that Adam and Abel understood something. They understood that God cannot be approached without blood. This amazing testimony of Scripture given at the beginning of human history shows that God cannot be approached without the blood. There can be no fellowship or favor given apart from the blood. So Noah, a descendant of Adam understood this truth because in Genesis 7:1-2: “Then the Lord said to Noah, ‘Come into the ark, you and all your household, because I have seen that you are righteous before Me in this in this generation. You shall take with you seven each of every clean animal, a male and his female; two each of animals that are unclean, a male and his female. '” Why the seven? For sacrifice, and the two were for preservation. So now, Noah, after the flood, he baptized the earth with the blood. The very first act of Noah after he comes out of the Ark, he offers a burnt offering. Why? To establish the Covenant with God. Adam and Abel understood that and now Noah understood that. After God calls Abraham and gives him the promises in Genesis 12 what is the first thing that he does? The first thing he does once reaching the promised land is what it says very clearly in Genesis 12:7: “Then the Lord appeared to Abram and said, ‘To your descendants I will give this land.’ And there Abram built an altar to the Lord, who had appeared to him.” God calls him in Genesis 12:1 and now he shows up in the land of promise and the first thing he does is build an altar unto the Lord and offers blood. To Adam, God reveals the blood covenant to him and Abel understood that without the blood no one can approach God or have favor with God; and Abel, God reveals that Covenant to him, the first thing he does is he offers is a lamb and the blood. Noah, the first thing he does when he comes out of the Ark he offers blood. He baptizes the earth with blood. Abraham comes into the promised land and the first thing he does is build an altar unto God and offers a sacrifice and applies blood. He enters into a Covenant relationship with God through the blood. Isaac understood the power of the Covenant and when he comes into the land of promise, the first thing he does is build an altar and before anything happens he applies the blood. Genesis 26:24-25: “And the Lord appeared to him the same night and said, ‘I am the God of your father Abraham; do not fear, for I am with you. I will bless you and multiply your descendants for My servant Abraham’s sake.’ So he builds an altar there and called on the name of the Lord, and he pitched his tent there; and there Isaac’s servants dug a well.” Before anything happened or he even dug any wells, he offers a sacrifice and applies the blood because he understood without the blood, no Covenant. After Jacob came back from his uncle Laban’s home what does he do? The same thing. in Genesis 33:18-20: “Then Jacob came safely to the city of Schechem, which is in the land of Canaan, when he came from Padan Aram; and he pitched his tent before the city. And he bought the parcel of land, where he had pitched his tent, from the children of Hamor, Shechem’s father, for one hundred pieces of money. Then he erected an altar there and called it El Elohe Israel.” Jacob began to understand the power and strength of the blood Covenant. What the blood accomplished in the lives of these patriarchs now has to be experienced by their descendants, Israel. The first thing God has them do before they leave Egypt is apply the blood. Exodus 12:13-14: “Now the blood shall be a sign for you on the houses where you are. And when I see the blood, I will pass over you; and the plague shall not be on you to destroy you when I strike the land of Egypt. So this day shall be to you a memorial; and you shall keep it as a feast to the Lord throughout your generations, You shall keep it as a feast by an everlasting ordinance.” Exodus 12:23: “For the Lord will pass through to strike the Egyptians and when He sees the blood on the lintel and on the two doorposts, the Lord will pass over the door and I will not allow the destroyer to come into your houses to strike you.” This is where the word Passover comes from. This is Passover week. We should not rest until we understand the redemption by the Blood of Jesus. These are what the Blood gives. The power of the Blood is its life. Leviticus 17:11: “For the life of the flesh is in the blood, and I have given it to you upon the altar to make atonement for your souls; for it is the blood that makes atonement for the soul.” Life is in the Blood. The value of the Blood of Jesus is the value of His Life. The same value on His Life is His Blood When Jesus died on the Cross He shed all of His Blood when He said, “It is finished.” He could not take upon Him our sin while His Blood was still in His body because His Blood could not be polluted when He took our sins. He was alive by the Spirit and when the Spirit left Him, then He took our sins upon Him. His Blood had to be completely gone before He could take our sins since His Blood cannot be polluted for it was sinless, holy and alive. His Blood remained alive after He died. Your life is in your blood and when you die your blood becomes quickly polluted. Your blood is now corrupt when you die. The Blood of Jesus was never polluted because He took all of His Blood with Him when He went to Heaven. When you die your blood will be corrupted. When you are raised again or when you are raptured you will have a new body and you will not need blood. The Blood of Jesus will remain forever. The value of His Blood is the value of His life. The power of the Blood is nothing less than the eternal power of God Himself. The Blood of Jesus opened His grave. What did the Blood of Jesus accomplish? The Blood of Jesus opened His grave. The Blood of Jesus opened Heaven. He entered Heaven with His Blood and now the saints can go to Heaven. Enoch and Elijah were the only ones who went to Heaven before Jesus Blood was shed. The Old Testament saints did not go to Heaven when they died. They had to go to a place called Paradise because the Heaven was closed. Jesus’ Blood opened Heaven. The saints could now go to Heaven. Today, we all go to Heaven when we die because of the Blood. The way to answered prayer is by the Blood. The Blood has the power to open you heart. It is harder to open the hearts of men than to open the grave. The Blood of Jesus satisfies the law and righteousness of God. Jesus defeated Satan by the power of His Blood. The power of death and hell came to an end by His Blood and only by His Blood. By the Blood we can approach Jesus through the sprinkling of His Blood. Through the Blood we can approach God. When we pray we can come before the Throne of Grace and we owe its existence to the Blood of Christ. The Blood opens our hearts. 1st Peter 1:18-19: “knowing that you were not redeemed with corruptible things, like silver or gold, from your aimless conduct received by tradition from your fathers, but with the precious blood of Christ, as of a lamb without blemish and without spot.” Only the Blood of Jesus can liberate human hearts. Now we are redeemed through the Blood. “Let the redeemed of the Lord say so!” Psalm 107:2. This declaration brings liberty to the believer. When you say it you defeat the powers of hell. The Devil doesn’t know your thoughts, but he hears your words so declare it aloud! You do not belong to the Devil. Jesus now has complete authority over your body. You now belong to Jesus. Tell the Devil you belong to Jesus. Don’t be afraid of the Devil. He is afraid of you because of the Blood of Jesus. “*** we are more than conquerors through Him who loved us.” Romans 8:37. Be bold like a lion. Do not be afraid. The Devil is a defeated foe and He knows it. It is time that you know it! You are redeemed! “***You are a royal priesthood, a holy nation, His own special people, that you may proclaim the praises of Him who called you out of darkness into His marvelous light.” Ist Peter 2:9. You are children of the King of Kings and the Lord of lords. Reconciliation. Romans 3:24: “being justified freely by His grace through the redemption that is in Christ Jesus.” We are reconciled through faith in His Blood. Reconciliation is the removal and destruction of sin. It renders sin powerless. You have to fight for it. Say it! Declare it! The minute reconciliation sets in, the Devil loses his hold. Under the law you will be punished. Sin means death. Sin awakens God’s wrath. When you rebel against God you rob Him of His glory. Sin compels God to be your Opponent. Sin makes it impossible for God to fellowship with you. When you come into reconciliation you walk in love. You begin to experience His love. Reconciliation is God’s love. You have to live in a state of love. We are to fear the Lord. Sin will be powerless when you know who you are in Him. Reconciliation means “cover.” The Altar was covered by blood. God no longer sees your sin. It is covered by the Blood and you know who you are. Walk in your redemption declaring you are reconciled. The flesh is still there, but you are not its slave. You are living in the Presence of Jesus. This is the secret: Live in the Presence of Jesus. The second you stop practicing the Presence of the Lord the flesh comes alive. God looks and sees the Blood. In the Old Testament the clean animal took the sin of a guilty man. The animal bore the punishment by surrendering its life. The blood in that animal made reconciliation for the guilty man. God released His wrath on the animal instead of the guilty man. All of God’s wrath was on Jesus — not on you. You are reconciled. The blood of an animal cannot take away sin. Only the Blood of God’s Son can take away sin. The moment we are redeemed God no longer looks on our sin. He sees the Blood. “If we say that we have no sin, we deceive ourselves, and the truth is not in us. If we confess our sins, He is faithful and just to forgive us our sins and to cleanse us from all unrighteousness.” 1st John 1:8-9. Until you die you have the flesh. You have to practice the Presence of God. Prayer keeps the flesh under subjection. Stay in the Presence of Jesus. Cleansing. Cleansing goes beyond forgiveness. Ist John 1:7: “But if we walk in the light as He is in the light, we have fellowship with one another, and the Blood of Jesus Christ His Son cleanses us from all sin.” We are already forgiven. The Blood is cleansing us from all unrighteousness. We are spiritual, but we live in the physical every day so we must practice the Presence of Jesus. Cleansing is the inner work of removing the stain of sin. 2nd Corinthians 7:1: “Therefore, having these promises, beloved, let us cleanse ourselves from all filthiness of the flesh and spirit, perfecting holiness in the fear of God.” It is your job to be cleansed. Hebrews 9:14: “how much more shall the Blood of Christ, who through the eternal Spirit offered Himself without spot to God, cleanse your conscience from dead works to serve the living God?” The cleansing by the Blood purifies your conscience. Hebrews 10:22: “let us draw near with a true heart in full assurance of faith, having our hearts sprinkled from an evil conscience and our bodies washed with pure water.” We need cleansing of our conscience. A prayerless saint is compared to a dead sinner. Arise from the dead. Sleeping men are prayerless. Isaiah 52:1-2: “Awake, awake! Put on your strength, O Zion. Put on your beautiful garments, O Jerusalem, the holy city! For the uncircumcised and the unclean shall no longer come to you. Shake yourself from the dust, arise * * *.” Awake means “pray.” People who are sleeping are prayerless. When we stop praying the old nature comes back. The flesh comes back and all the old habits come back with it. Spiritually, wake up! Stop being a dead sinner. It is time to start praying! You need to pray at least one hour a day even if you divide it into segments. Daniel prayed four times a day. Read the Bible and pray and commune with the Lord daily. Sanctification. Sanctification is different than cleansing. Cleansing has to do with removing the stain of sin of the past. Sanctification is your new life being united with Christ. Hebrews 12:10: “For they indeed for a few days chastened us as seemed best to them, but He for our profit, that we may be partakers of His holiness. Heaven is not a small place. It is limitless. Haven has many different divisions. 2nd Corinthians 11:14: “And no wonder! For Satan himself transforms himself into an angel of light.” He steps into God’s Throne as an angel of light. When Satan brought the fall of Adam who was destined to be king of the planet, Satan took his kingdom and was recognized by God as having that kingdom. Lucifer had authority. God created man with a higher authority but Satan stole it from Adam and God recognizes it. The Devil took the authority from man so a man had to take it back. God gave to Adam legally. Adam gave it legally to Satan. Another man had to take it from Satan. That Man is Christ Jesus! He did not conquer him by the power of God. He conquered Satan by His perfection. The Holy Ghost was not with Him. It was the power of His human perfection. Sin did not touch Jesus. He was sinless. He is the only Man without sin and who lived a sinless life! God could not and did not take it from Satan because Adam legally gave it to him. For 4,000 years Satan could appear before God and accuse the saints. The Son of God came to earth in the flesh and conquered the Devil on his own territory. The Law installed Satan as the jailer of prisoners because we all sin. the Law is just. We show up not knowing the law. The law declared us slaves of sin and death. Satan uses the Law because we cannot obey the Law. The Law made Satan as keeper of the prison until Jesus came. The Law was now satisfied because of Jesus. The strength of sin is law. 1st Corinthians 15:56: “The sting of death is sin, and the strength of sin is the law.” This is the victory: Jesus cast out Satan. Now the sinner is delivered by the Blood of Christ Jesus. When the Blood was shed, Satan’s authority was destroyed. Satan lost access to Heaven through the death of Jesus on the Cross. John 12:31: “Now is the judgment of this world; now the ruler of the world will be cast out.” Satan was cast out and lost access to Heaven through Jesus’ death on the Cross. 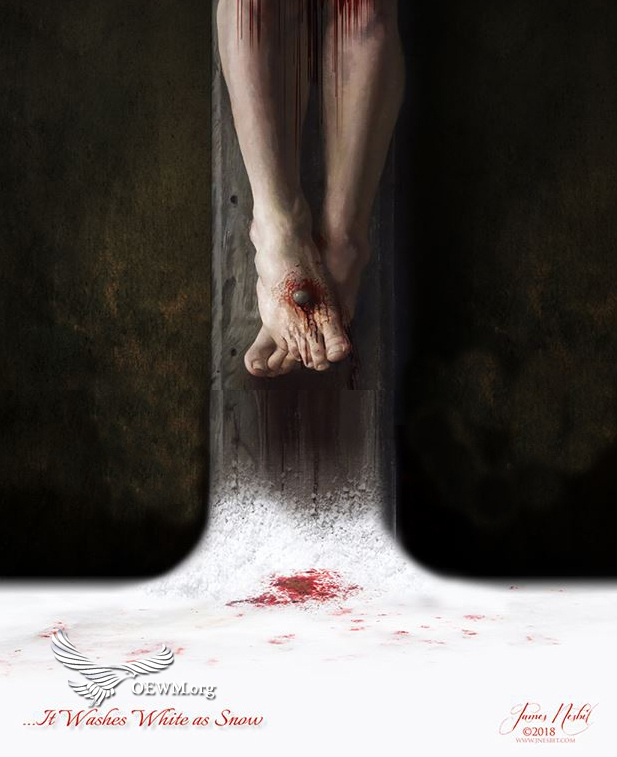 Jesus took all of His Blood with Him to Heaven. To drink His blood is not drinking the liquid. We drink of His blood spiritually and we receive His life! Talk about union? We long for full union with Christ Jesus. Only by the Holy Spirit can we understand this. We partake of His Blood means we partake of His life by the Spirit.